The planetary nebula Messier 76 (M 76), also known as NGC 650/651, is one of the most studied objects of its class, representing a remarkable object for the observer. But in spite of his fame, it is not easy to see. The image above comes from the “sigma clipping” combination of 13, 180 seconds images, unfiltered, remotely collected with the Tenagra III (“Pearl”) 16 “-f / 3.75 robotic unit part of the Tenagra Observatories in Arizona . The CCD camera is based on the KAF-16801 sensor, resulting in a resolution of 1.2 “/ pixel. 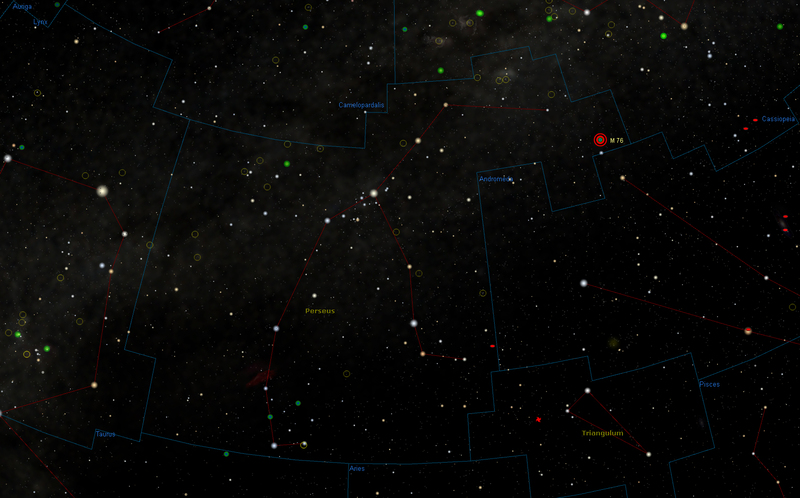 M76 is located in the eastern part of the Pegasus constellation, near the Andromeda edge. It is easy to find because it is located just south of the W Cassiopeia and roughly one degree North-Northwest from the star Alseiph, Phi Persei, of magnitude 4.0. Like all planetary nebulae, the distance is little known, estimated between 1.700 e 15.000 light years. It has an apparent magnitude of 10.1. It was also designated as NGC 650/1 because once it was believed it was made up of two emission nebulae. The small Dumbbell Nebula was discovered by French astronomer Pierre Méchain on September 5, 1780. Messier included it in his catalog on October 21st. The amateur astronomer Isaac Roberts discovered that it was formed by a single nebula and first suspected that it could be a large ring. Only in 1918, for the first time, Heber D. Curtis classified it as a planetary nebula. It apparently extends over an area of ​​2.7 x 1.8 square arcminues, which corresponds (assuming the recent estimates of about 2500 light years) to a real diameter of about 1.23 light years. The magnitude of the nebula and its brightness make it one of the most difficult Messier objects to observe. Big binoculars and small telescopes show Messier 76 as a widespread light spot. It shows more details if viewed through telescopes of medium to large diameter. A 20 cm notes its two lobes and the “lane” that separates them, while larger apertures show the structure of both the nebulous lobes and the evanescent alone surrounding them. The best time to observe the “Little Dumbbell” goes from Octobre to December. The small Dumbbell Nebula was formed in the final stages of the life of a Sun-like star, which released the outer parts of its structure, in its red giant phase. The expelled material is excited by the radiation of the remaining object in the center, which then emits energy and light. M 76 is classified as a bipolar planetary nebula (BPNe). 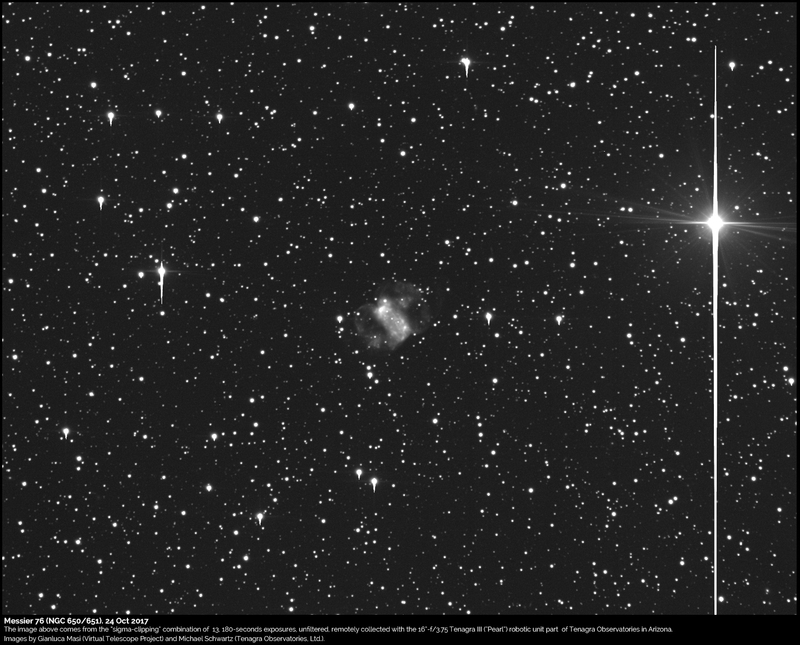 The central star, HD 10346, has a visual magnitude of 15.9 and a temperature of about 60000 K. The M 76 is also known to have in the center two stars, not one. The nebula itself has a surface temperature of 88400 K and approaches us at a speed of about 19.1 km / s. Its clouds are expanding at a speed of 42 km / s. The clouds will disperse over the next 1000 years and the central white dwarf will eventually cool down. It’s a good challenge to take pictures but it can give you a lot of satisfaction. It’s a little gem with a structure that resembles in its appearance and evolution the same charming “Cat’s Eye” nebula.